You can make this recipe with tilapia or any other mild white, flaky fish like cod or haddock. I top the fillets with a super-simple pineapple relish that has just three ingredients—and the entire dish is ready to serve in about 20 minutes. Preheat the oven to 375°F. Line a baking sheet with aluminum foil, and coat the foil with oil spray. Place the tilapia fillets on the prepared baking sheet and season them with the salt. In a small bowl, combine the pineapple, tomato, and chili paste. 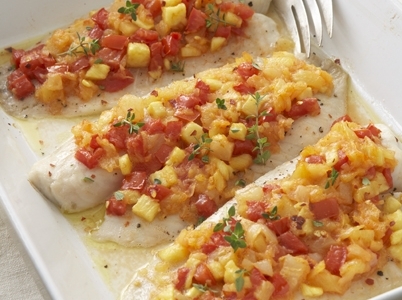 Divide the topping evenly among the tilapia fillets. Bake for 12 to 15 minutes, or until the tilapia flakes easily with a fork.